Posted: Thu Sep 15, 2011 7:23 pm Post subject: Is it fried ? Had a strange occurance today. I have two MJ and two thin clients. I leave both TC running 24/7. One of the lines would not make or receive calls, so I decided to shut the power bar off that are connected to both machines. The unit that I was having call issues, turned on, rebooted and works like it should. The other unit does not have a green light on anymore and does not seem to boot up. However, the MagicJack unit does display a light so it would seem there is power in the ThinClient. Any ideas what could be going on ? Really don't want to spend money on parts, just any easy stuff that I can try. The units have pretty much worked flawlessly and don't want to invest in anything else at this point. Okay... will try that this weekend... never cracked open a TC before. Hope I don't mess it up more. I guess obvious precautions.. unplug unit, try to neutralize static electricity. Anything else to consider ? Not really, pretty much straight forward. Just don't yank it open, as there is a speaker wire that could be pulled loose if you don't unplug it before opening the case all the way. Just open slowly, the wire and connector plug will be obvious. Posted: Thu Sep 15, 2011 8:09 pm Post subject: Re: Is it fried ? Before you open it up, plug a monitor into it and restart it. You may find out all you need to know from watching for the point at which it fails. Probably be a good idea to attach a keyboard, too. It may ask for a keypress to continue or enter CMOS setup. Dogcatchers advice is sound. Also in the BIOS check your power up restart settings. Well... I suppose that is the issue.... how do I get it to boot? I've tried the power button many times. Tried with another power adpater. No go. All you know now is that the green light doesn't come on but the blue light on the Magicjack does. Plug a monitor in and confirm that it doesn't attempt to boot. If no information is forthcoming then open it up and reseat anything that is socketed. Or, at least push them down firmly. This whole exercise should take 5 minutes top. Plugged in the monitor anyways... nothing. The monitor is not receiving any signal. And something else I just realized, how can the MJ unit actually have it's own light on? Maybe the TC is "on" just not showing me a green light ? Even then.. MJ not working. Will get my can opener on the weekend and see what's inside! Make sure you unplug any usb devices from the TC and try again with a monitor and keyboard attached. It is pretty easy only four screws to take it apart. The only trouble I have had with any of mine was one of the heat sinks is glued on with thermal cement. I found it was loose and that caused some problems but as I recall it would still boot up. Ordered some thermal glue from DX. Well.. no dice. I opened up carefully and everything is tight and in it's place. I even took the battery out and put it back in. All heat sinks, memory, and anything else I can put my finger on is solid. Any other suggestions? Thanks so far for those that did respond! Sounds like you've done everything you could do. Probably time to declare it finished. When I was in the computer hardware business I'd console my clients with the simple observation that nothing lasts forever. I have a 5710 listed in the For Sale section that has been doing continuous duty for over a year. I'm not going to renew my Magicjack so it will be of no further use to me. But, we probably shouldn't go there. (1) you said you didn't want to spend any money and (2) shipping to Canada can be a bit of a pain. Yes.. I guess it gone to electronics heaven ! The unit is labelled as being manufactured in January 2006. I bought it used in April 2010 (or there abouts). So I guess it doesn't owe me nothing. I guess I can keep the power cord and adapter as a back up to my other unit. The reason why I want to keep it cheap is I want to wait until MJ comes up with an Android App or Windows Phone App or Iphone App. Then there is no need for a dongle (like nettalk duo app). For now I can run MJ when I'm home off a laptop, but that is not as convenient. The less hardware the better. Would even consider buying an MJPlus at this point since all the TC was doing was acting as a low cost power source. In the meantime I'll tinker with the TC as time allows (rainy day project or when the snow is flying !). 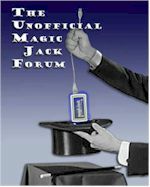 Oh... looks like MagicJack Plus is now available through their website! "Use with or WITHOUT a computer" right on the front page. Also all the pictures show MagicJack Plus. And here's a link to a story about an App for iOS. I knew it was coming but didn't know how fast it would be available! If you have a voltage meter, I'd check that you have power coming out of the power supply cord. No power, usually means a bad power supply, but not always.